Special Combo comes with 150 pink roses nicely arranged in a tall basket with lot of green fillers and 4Kg Butterscotch cake the flavor of your choice (vanilla, chocolate, butterscotch, black forest, strawberry and pineapple). Our expert florist has arranged one hundred delicate pink roses with green fillers in a basket. The tall arrangement of these pretty roses is breathtakingly beautiful. Send roses bouquet online and impress your loved one, the romantic pink roses will surely make that important person special. 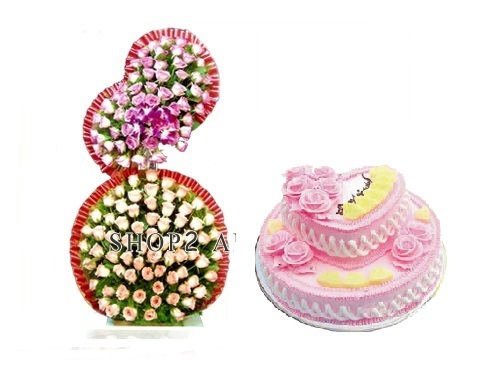 Send the Special Combo of pink roses and fresh cake on auspicious occasions like birthdays, anniversaries, retirement, baby showers, graduation etc.